Popularly served with donburi (rice-bowls) such as gyūdon and katsudon, beni shōga is perhaps one of the most common pickles found in Japan. 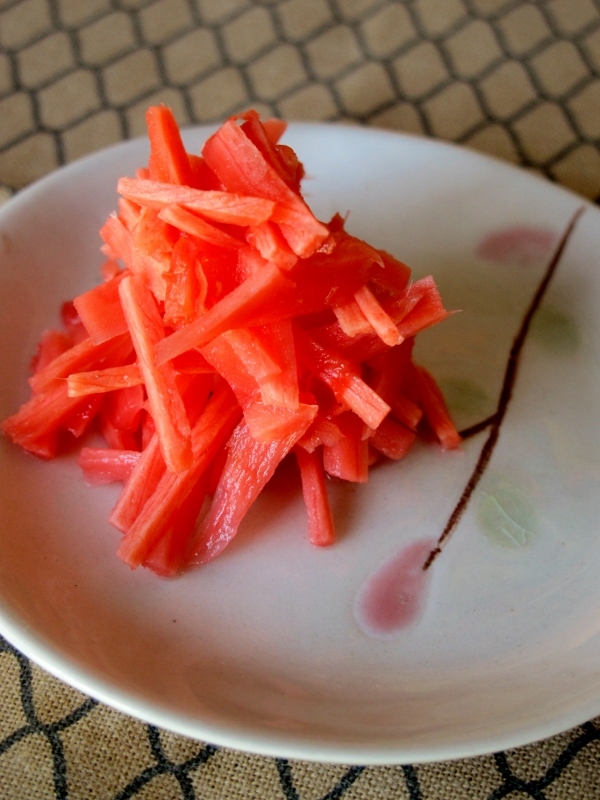 Unlike most other Japanese pickles, beni shōga is, in fact, eaten more like a condiment than a side dish. Much like one would expect to find an obligatory bottle of ketchup on a table in the Western-style dinner, many Japanese eateries have bowls of beni shōga for their patrons to pile onto their donburi. It is so readily available throughout Japan, these slithers of red ginger are (to my mind at least) synonymous with a wide range of my favourite Japanese dishes, so much so, none of which taste the same without it. Unfortunately, beni shōga is very hard to find outside of Japan – something that I find deeply frustrating given its integral role in so many Japanese dishes. My irritation with the lack of authentic Japanese ingredients available in the rest of the world is compounded, in part, by the continued popularity of the lumo-pink version of gari that has become a plague upon Japanese cuisine in the West. Not only is our beloved “garish-gari” a pickled aberration not found in Japan (where it’s a considerably less alarming beige), it has also served to limit our appreciation and expectations of the diversity of Japanese food. Next time you top your sushi with that Barbie-pink slice of ginger, please give a pause to consider the other amazing taste experiences that have been side-lined in the attempt to repackage and homogenise Japanese food for Western tastes. Our ever developing palettes deserve diversity and until we put down our salmon nigiri and demand better, simple delights like beni shōga will forever be beyond our common reach. With all that said, what’s a man to do? Well if you are me, you’ve just got to make your own beni shōga, of course! After resolving to take my pickle-destiny into my own hands, I discovered that making my own beni shōga may not seem as impossible as I first assumed. Other than the standard pickling liquid, the lay-men’s recipe really just has two ingredients – ginger and umeboshi (pickled Japanese plums). 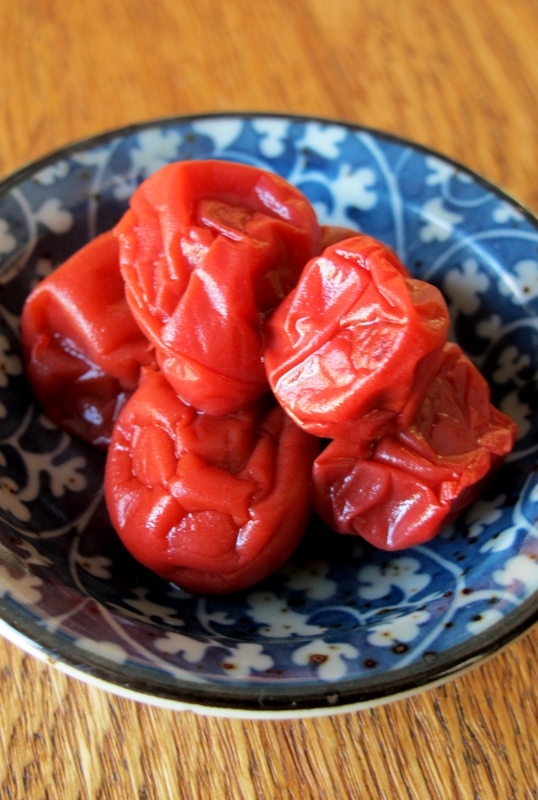 Luckily, umeboshi also features in Chinese cuisine and is therefore relatively easy to source locally. Pickled red from the juices of the Japanese plum (ume), the ginger does take a bit of time to take on the colour from the plums, but the end result is a pretty close approximation to the real thing. It may not be perfect, but given the scarcity of beni shōga outside Japan, who would really know the difference anyway!